Drew Brees could be in for a shoot out this afternoon and has plenty of tools around him to put up great numbers. I also like Saquon Barley to have a break out game today and be very dangerous. 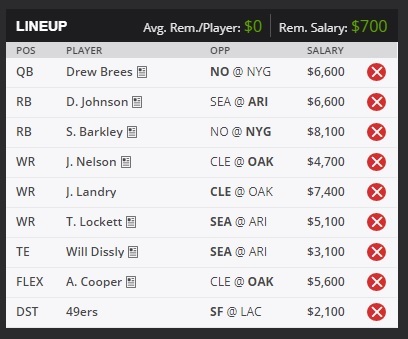 Im throwing the 49ers defense into this lineup to save salary room and because I think all of the late games are going to be high scoring.